"You don't have to be crazy to blow 30 million dollars in 30 days. But it helps." At a time when over 4 million Americans (yours truly included) are considered "long-term unemployed" for reasons outside of their control (i.e. there aren't jobs out there...), it's nice to have a film like "Brewster's Millions" to look at and laugh yourself silly, where you see how crazy money can make a person. The film, drawn from the 1902 novel (like nine other adaptations...), tells the story of a man who has inherited a sum of money from a deceased relative, with some interesting conditions. In the film, Monty Brewster (played by the incomparable Richard Pryor) has been left a challenge by his great uncle. He inherit one million dollars, right now, no questions asked. Or, he can inherit thirty million dollars, that he needs to completely get rid of, in thirty days, without acquiring anything, and if he succeeds, he'll inherit three hundred million dollars. Let me repeat that, he can't own anything at the end of those thirty days. Oh sure, there are allowances for him to gamble some away, for him to give some to charity, but he can't have any assets, and he can't destroy anything of value. And he can't tell anyone what he's doing. Not his accountant. Not his best friend. Now keep in mind, Monty Brewster is as broke as they come when the story starts. He's a down on his luck baseball player, and he's never earned more than $11,000 in a year. The idea of spending thirty million dollars in thirty days seems like it's insane, but, as Brewster says, it also sounds like "a hell of a lot of fun." The film comes from Walter Hill, who's biggest claims to fame are directing the two "48 Hours" movies with Eddie Murphy and Nick Nolte. For those movies, and for this, Hill's greatest strength is mostly in knowing how to let the camera just stay out of the way while the stars are acting, in a very natural fashion. This isn't to say he's a bad director - just that he isn't flashy, and he lets the films sort of grow organically. Pryor and John Candy (who plays Brewster's best friend, and catcher, Spike) really are the core of this film. Part of the fun is in watching Pryor just go at it a mile a minute and seeing John Candy whirling to try and keep up. Critics of the time criticized the film for not being fast-paced enough to be a screwball comedy, but I've always disagreed. This is a film about the buildup. Several of the scenes play out like mini-movies, with motifs building and building and building until there's a boil over and everything comes crashing in. 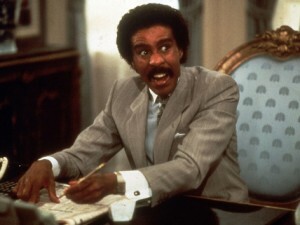 Pryor's always been great at this kind of thing, and "Brewster's Millions" is no exception. You might think it would be particularly easy to spend thirty million dollars, but it all comes back to that one key catch - he can't own anything. If he does, if he has any assets, he gets absolutely nothing. And several times when he thinks he's doing well, money keeps on boomeranging back to him. It's as though when he wanted money in his life, he couldn't get any, and now when he wants to get rid of it, he can't do that either. And that's the fun of it. The only thing I can think of that would've really nailed it home was if there was a little number that would've popped up in the bottom corner whenever money went in or out in large chunks, but that's just me thinking of how I might approach it. There are lots of side things I could talk about in this movie that I've always found great - the weird logic it takes to spend money without getting anything for it, how casually some of the weirdness of baseball folds into this film (yep, that's Jerry Orbach of "Law and Order" fame as Brewster's baseball team's coach! ), the craziness of running for office, the difficulty in staying on a path without telling anyone why - but really, when you get right down to it, the movie's just funny as hell, and if you haven't seen it, you can pick up the DVD for $5 off Amazon. And that's a steal no matter how you look at it.